The year 2013 marks the legendary 50th anniversary of Lamborghini -- a year of celebratory events and activities that will take place around the world. 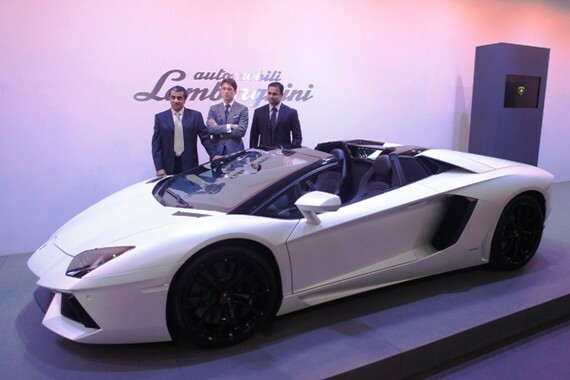 The launch of Aventador Roadster is a perfect beginning to this year in India. The new Lamborghini Aventador LP 700-4 Roadster can be easily recognised by the unique profile of its upper area, which extends along the newly designed geometric lines from the removable roof to the engine hood. The two-piece roof is made entirely from carbon fibre using various technologies such as RTM and Forged Composite. These technologies guarantee maximum aesthetic performance and stiffness although each component is extremely light, weighing less than 6 kg. Even the interior has a new look. The use of leather called Sabbia Nefertem highlights the hand-made upholstery from Sant' Agata Bolognese and the exterior in Azzuro Thetis. The new Aventador LP 700-4 Roadster also features new Dione 20"/21" rims with a daring, aggressive look. Crafted in light forged aluminum, they lower the weight of the vehicle by 10 Kg as compared with the standard set of rims. The new Aventador LP700-4 Roadster boasts record performance. It accelerates from 0 to 100 km/hour in only 3 seconds flat and has a maximum speed of some 350 km/hour. The new Lamborghini Aventador LP 700-4 Roadster is an absolute object of desire which is priced at Rs. 4.7 crore or Rs 47 million (ex-showroom Delhi). The new Roadster will go on sale from mid 2013 at Lamborghini dealers nationwide. Image: From L to R: Mohan Mariwala, managing director, Auto Hangar (India) Pvt. Ltd., Andrea Baldi, sales manager, South East Asia and Pacific, Automobili Lamborghini S.p.A and Pavan Shetty, head of operations, Lamborghini India posing with the Aventador LP 700-4 Roadster.